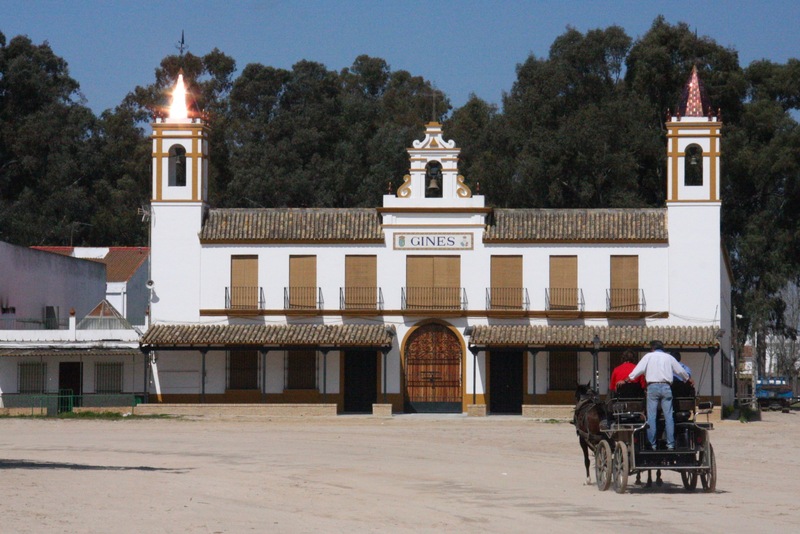 If you arrived in El Rocío without any prior knowledge of this peculiar town, you could easily be forgiven for wondering if you’d somehow time-travelled back to the Wild West. 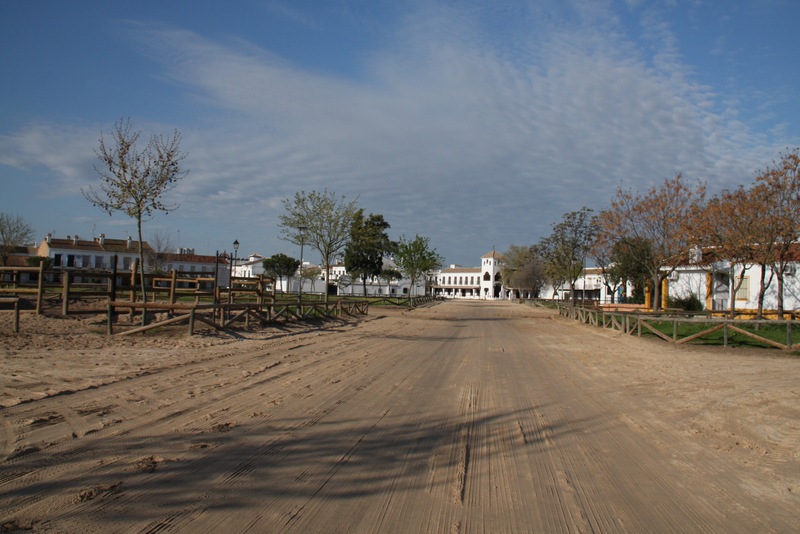 People ride past on horses, wooden buildings with wide verandas line broad sandy streets, down which horse-drawn carriages rattle. There are wooden railings for tying up horses all over town. It just needs a saloon and a sheriff’s office to complete the picture. 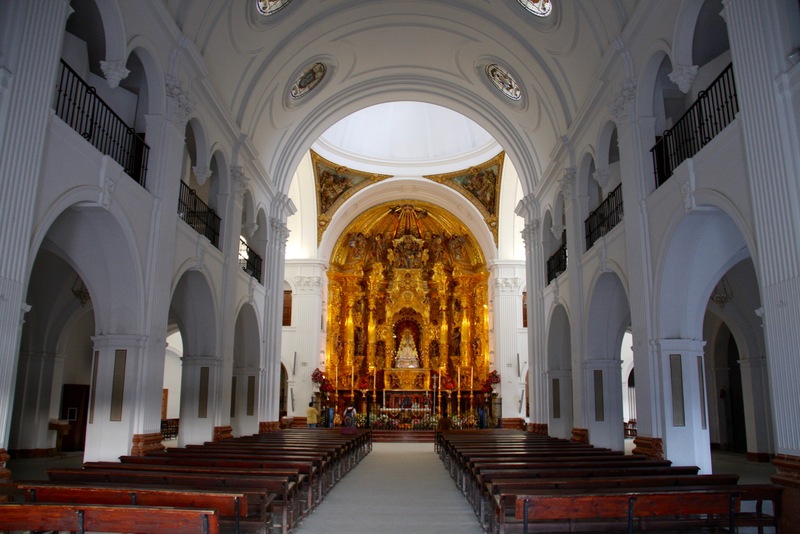 The brilliant white Ermita de Nuestra Señora de El Rocío, an enormously over-sized church, is a jolting reminder that you’re still in Spain. Inside lies the answer to the many questions El Rocío poses, foremost amongst which is, why does this bizarre place exist? 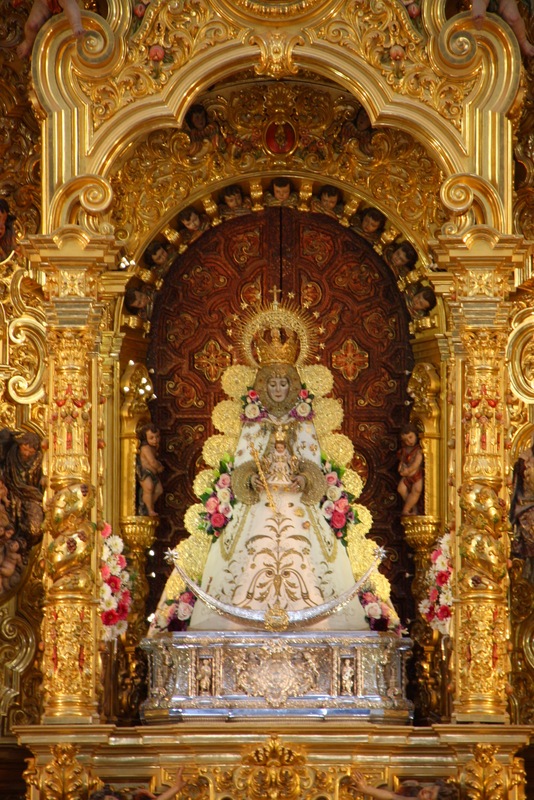 The church houses the 13th century wooden Virgen del Rocío, and she is at the centre of an annual pilgrimage that attracts close to a million people. The Romería del Rocío is Spain’s largest religious festival, and possibly its biggest party. If the town was quiet when we were there, it’s bedlam during Pentecost when pilgrims arrive. 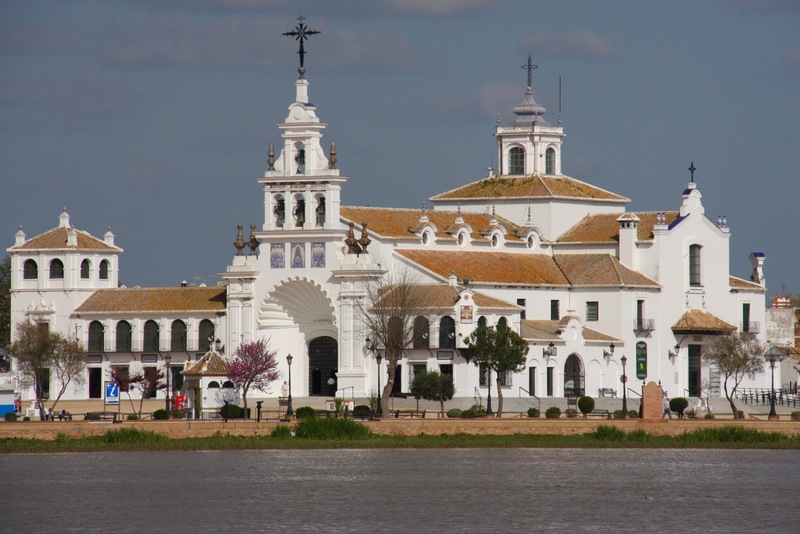 People from across Andalusia make the pilgrimage to El Rocío dressed in traditional clothes and driving covered wagons pulled by oxen. These are organised by hermandades, Catholic brotherhoods with their origins in medieval Spain. 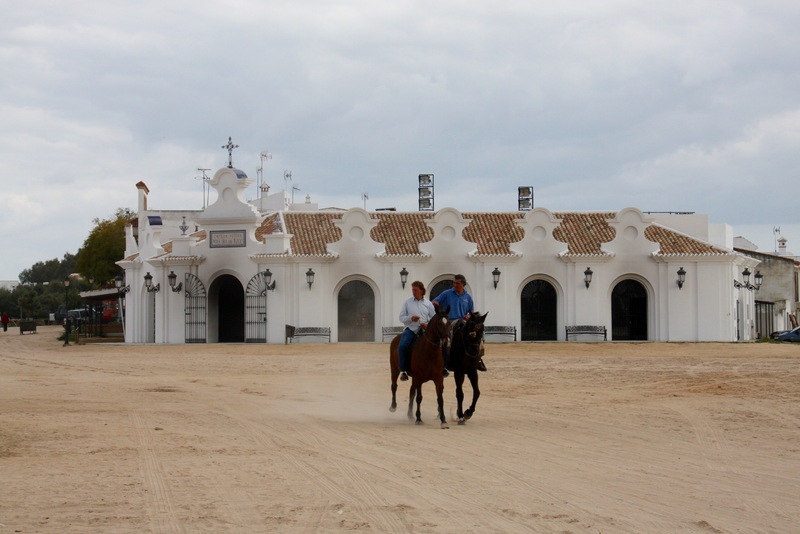 Many of the buildings in El Rocío belong to the hermandades and house people and animals during the fiesta. 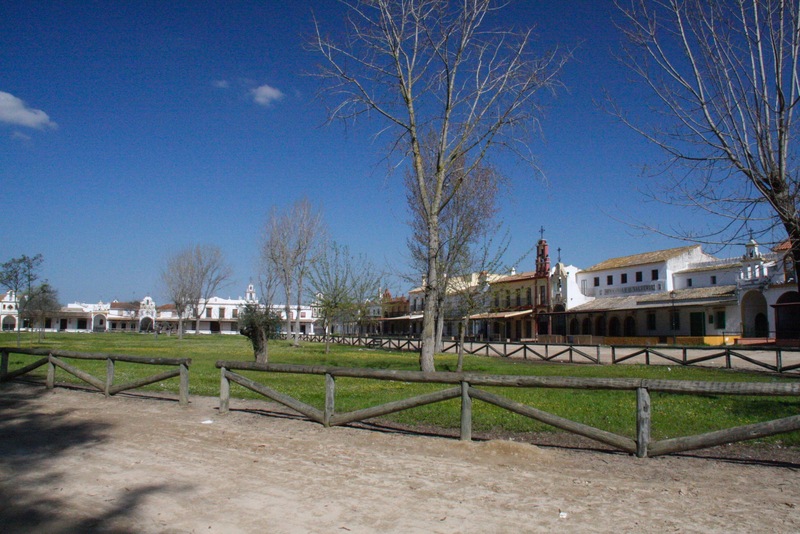 Outside of the Romería, El Rocío is a sleepy place. Even though there is a steady stream of worshipers and tourists visiting the Virgen, it felt like we’d arrived in a ghost town. 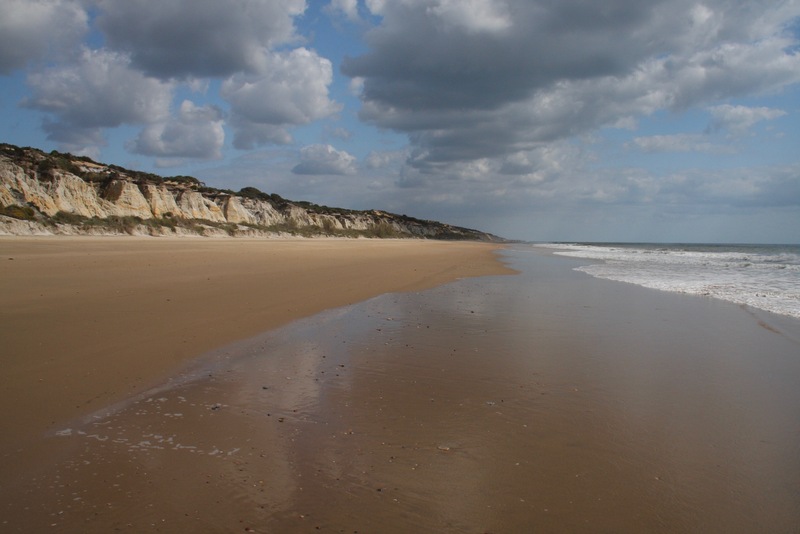 Luckily, there are other things to occupy you in the area, including good walks and some excellent wild beaches along the nearby coastline. It’s also a twitcher’s paradise. 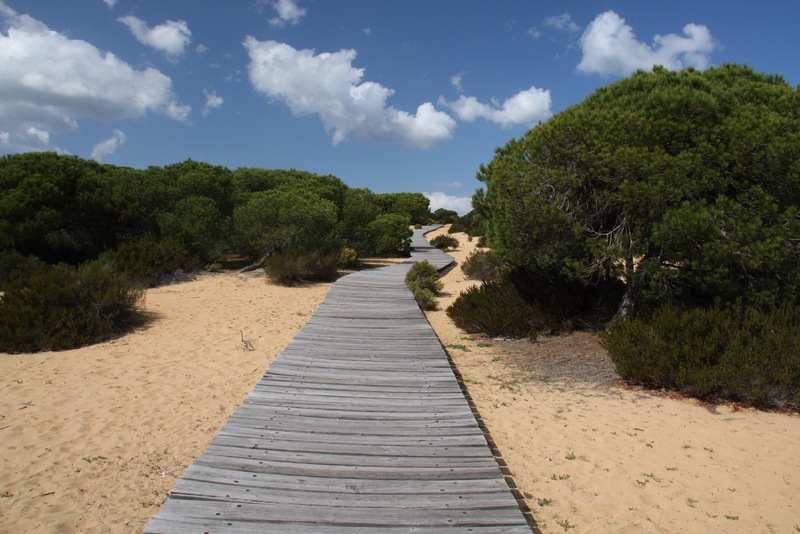 El Rocío sits on the edge of the Parque Nacional de Doñana. 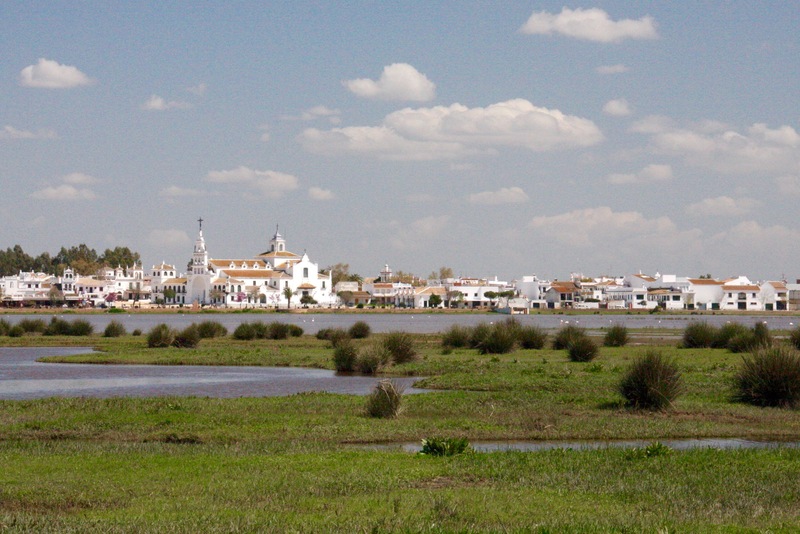 One of the most important wetlands in Europe, and a protected area, it attracts almost as many migrating birds as the Virgen del Rocío attracts pilgrims. 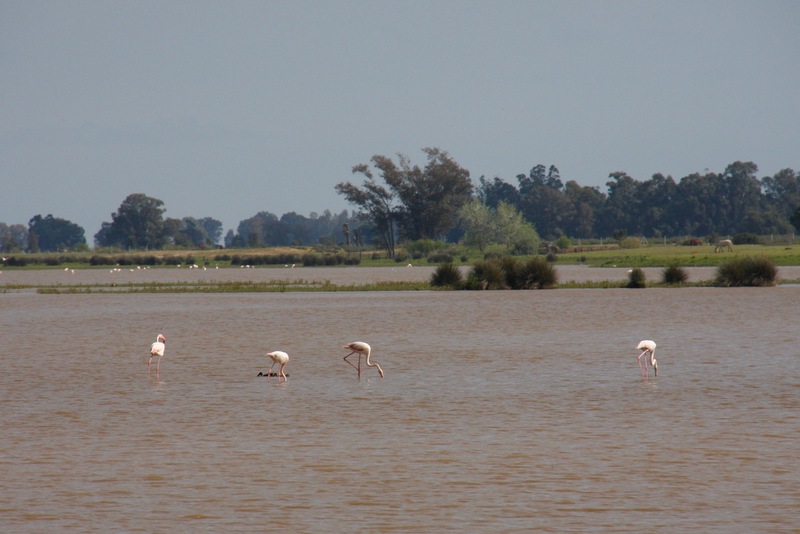 The village itself is built on the shore of the tranquil Marismas del Rocío, a wetland area that is home to plenty of birds, including flamingoes, herons and storks. 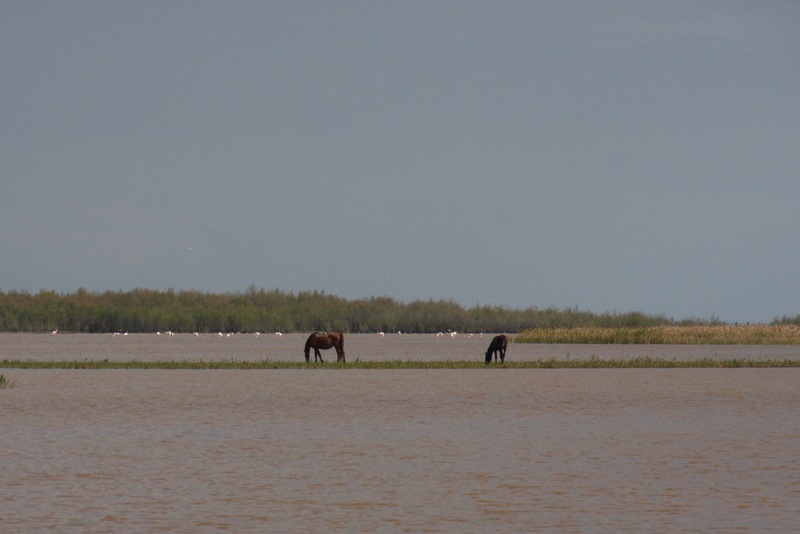 You can also see deer and wild horses around the lake. We spent a few hours wandering around the town and lake, had some lunch and then headed to the coast. 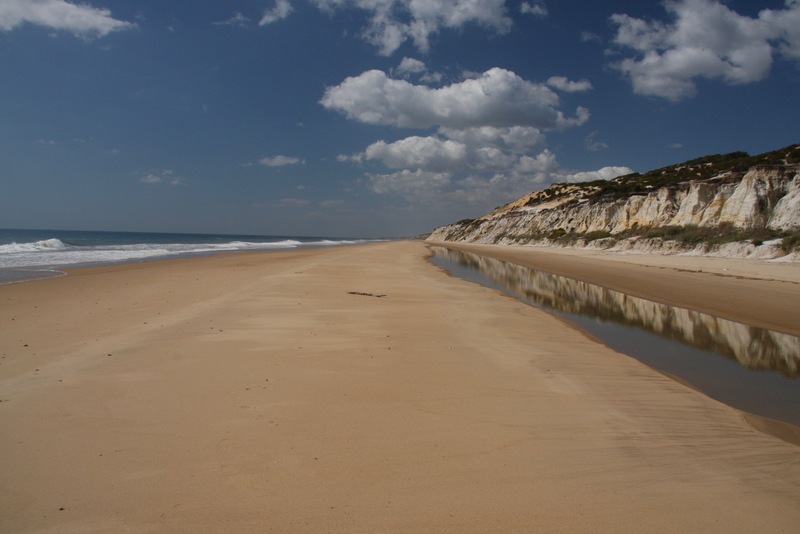 The Acantilado del Asperillo is a protected area of coastline that is home to a dune system that culminates in low cliffs at the edge of a pristine beach. 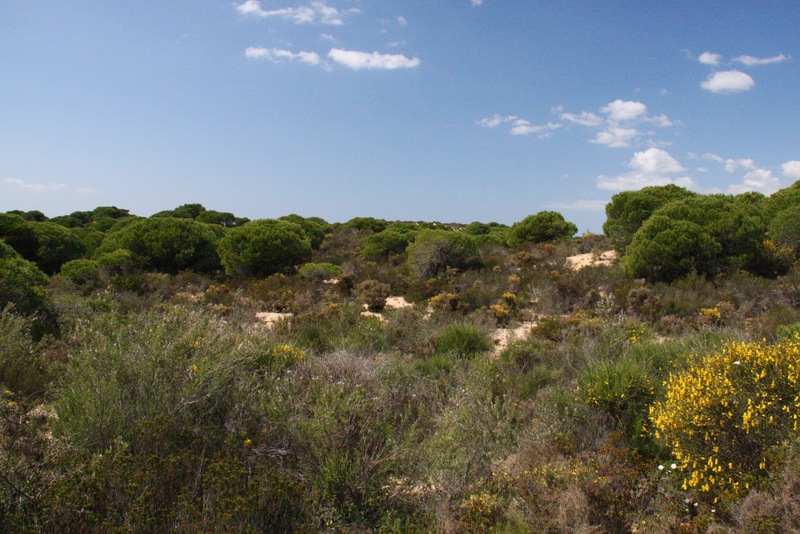 It’s also an important habitat for the endangered Iberian Lynx. 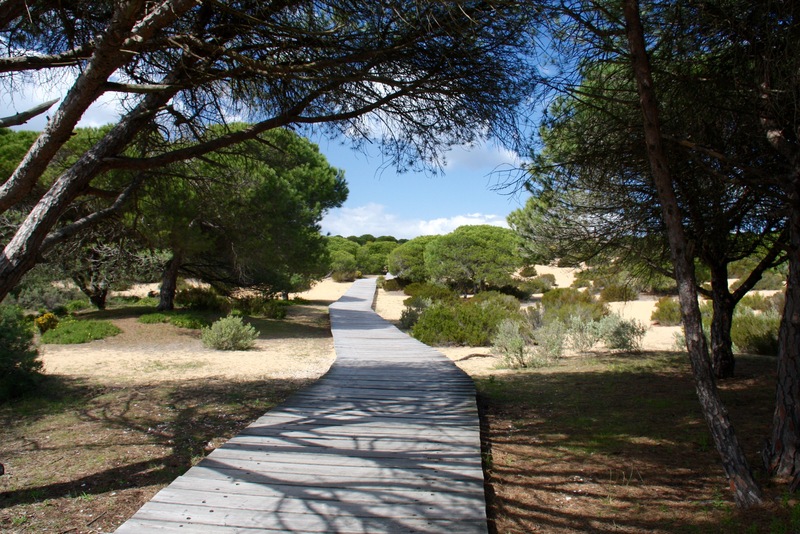 To protect the habitat, boardwalks lead from a scattering of parking areas through the dunes to the beach. The car park was empty when we arrived, as was the beach. 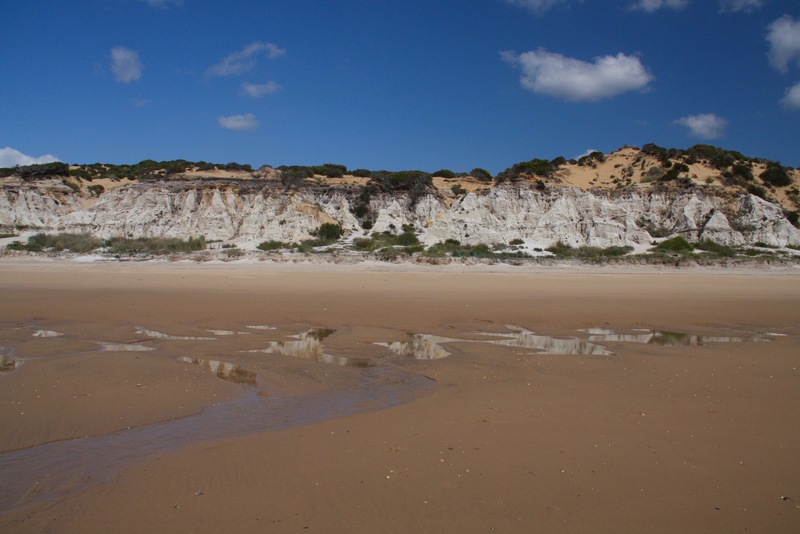 In fact, we had several kilometres of beach entirely to ourselves. Another benefit of being in Andalusia out of season. 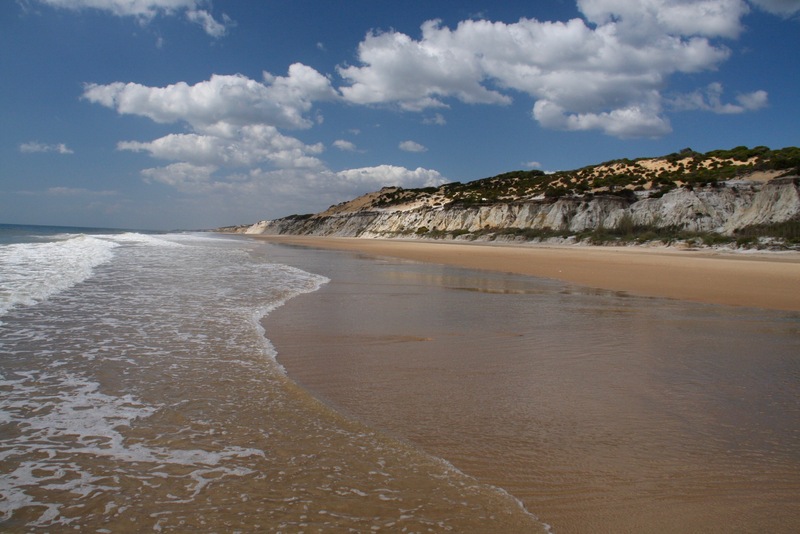 The beach is very attractive, although this is Spain’s Atlantic coast and the water isn’t exactly warm. We spent the rest of the day beach combing and relaxing, finally returning to our hotel to watch the sunset over the lake in El Rocío.